"​While we chose Eagle Creek for its small class sizes and individualized learning plans, we quickly realized that the philosophy toward customized opportunities extends beyond academics. Mrs. Kulp is excellent in her responsiveness. In the past two years, we have suggested and she has implemented a drama club, a T-ball clinic and violin instruction. Simply stated, ECA solicits and is accepting of feedback." "​I am thankful from the bottom of my heart for the love of reading and math that you have inspired. My daughter takes a pencil and notebook with her wherever she goes in case she needs to write about it! You will love this: she writes her own addition problems and makes us give her a test!" ​"This is my daughter's first year at Eagle Creek and first time taking Spanish. Since starting just a month ago, she is already singing songs in Spanish and bringing home Spanish work done in class. I am amazed at how quickly she has picked it up. Her Spanish teacher is fantastic and relates very well to children. I am so pleased and impressed!" "Since the first day, my daughter has felt immediately at ease upon arrival in her preschool room. I appreciate the often daily updates, photos and videos. My daughter is flourishing in the small group and structured learning environment. Her confidence continues to build as she learns to sound out words, spell, and do simple addition. Beyond the incredible academics, the office sends out weekly newsletters that I really enjoy. The staff encourages thoughtfulness and kindness, and it resonates in everyone I have met, including the parents." "Our daughter is absolutely loving the golf program. I've gone to watch, and the instructors are extremely knowledgeable and work wonderfully with the kids. Senorita's Spanish yoga class was phenomenal, too. She is patient and does a great job giving instructions mostly in Spanish." "When my daughter graduates from ECA this spring, she will have spent seven important years of her life there. The commitment of driving a child thirty miles to school is not easy, but what ECA has provided for my daughter is priceless. My daughter is not just an amazing student, she has become an exceptional person. ECA’s culture offers a perfect setting to grow great kids." "We feel very fortunate that we found Eagle Creek Academy when our son was so young and were able to stay for so long. It has been an amazing experience. The teachers and administration really care about his development. You have a great team." "We appreciate the small class sizes, and we are 100% satisfied with the high-quality curriculum, the teachers' positive attitude, and the variety of learning activities. The Kindergarten teachers are amazing. They are attentive, energetic and helpful, and they tailor each child's learning path, giving individualized attention to each child. We recommend Eagle Creek Academy to every family out there. It is the best of the best!" "The focus on academics is very strong. We feel confident that our children's abilities are truly understood. It's terrific that they can learn so much and have fun at the same time." "Our daughter loves being at preschool. Being in an environment she adores has been so beneficial to her overall development, much more than being with a babysitter. We are amazed with how much she has learned, and we appreciate your willingness to reorganize the schedule for us." "I love the creative ways you find to teach. One of my absolute faves was when each child had to draw a picture of another child and write a story to accompany it. I love the way the kids move about the classroom to work with partners and small groups." "We trust you all so much." "We have had a GREAT experience at ECA. We love the small group learning. We love that children who need extra challenges get them, and the kids who need extra help get it. The teachers are all warm, welcoming and nurturing, which is great for the children's self-esteem. This is what sets ECA apart." "​The teachers at Eagle Creek have inspired our kids and pushed them to be the best they can be, both academically and personally. We have been a part of the Eagle Creek family for eight years and can confidently say that the friends we have made here (kids and parents alike) will be lifelong friends." "ECA is an awesome place. Inside this beautiful building are teachers who care about every student. Our daughter was so happy about having Mrs. Kasal that she was thinking of a way to repeat the fourth grade just to have her again. Of course, she discovered that Mr. Pietrzak for fifth grade was equally as exciting. I can't say enough about this school. We live 45 minutes away, and it is worth every mile we drive." "​You have an excellent strategy for working with new English speakers. I was happy that my children stayed with their new friends in their regular classroom, instead of going to a separate room. We were also grateful that you supplied a tutor to help them with their math and science vocabulary. Thank you for going the extra mile!" "What an amazing year it has been! We can't imagine our daughter having a better teacher than you. We appreciated your desire to make sure she was truly comprehending what she was reading. We also appreciated your insights on her social development, which gave us some teachable moments at home. You are truly gifted at what you do and how you relate to children." "Eagle Creek Academy has helped my son develop a sense of self-confidence through continually adjusting the lessons to challenge him in his reading group. Since the teacher-to-student ratios are so good, the teachers can quickly make those adjustments.​ From the teachers to the administrative level, everyone is dedicated, open and helpful. I am so happy to have found ECA!" "Eagle Creek's Kindergarten teachers took our daughter in, and through daily interaction, evaluated whether she was above-level, at-level, or struggling in each subject. They continually find ways to maximize her learning, regularly tweaking their teaching to give her the extra challenges she needs. This is priceless. For parents who want a school that goes beyond one-lesson-fits-all learning, consider ECA." "I am impressed with how much my son has advanced not only in reading, writing and math, but with his social skills and the management of his emotions. He is so independent and mature these days. I love the way his teacher treats the kids." "We love our son’s preschool class. He is learning so much socially and academically. We are thrilled to see him start reading. He loves school, which makes us so happy!" "Love the school! Love the smaller classes and fun environment for the kids! This is our fourth year, and we love the young girl our daughter is becoming! We plan on staying through middle school!" "Our decision to have our son attend Eagle Creek Academy was based on the fact that it is a nut-free school with very allergy-aware policies and a staff we felt confident could help ensure the safety of our highly allergic son. Knowing the school chef knows our son's allergies and is always looking out for his safety has brought us immeasurable peace." "Eagle Creek has impressed me. My daughter is in preschool and has excelled beyond all my expectations. Her teacher has done an amazing job working with her at her level and helping her achieve things that I would not have thought a three-year-old could achieve. Great school and a great staff." "Eagle Creek has extremely experienced teachers who nurture and guide with kindness and consistency. It is obvious Eagle Creek's principal goes to great lengths to ensure that the staff is extraordinary." "Eagle Creek Academy is a great fit for our family, because it provides a customized learning experience for each of our four children. I am confident that my children are being challenged in the subjects in which they naturally excel and are receiving the extra assistance needed in the subjects that they have not yet mastered." "We are looking forward to the new school year, and especially the focus on the gifted and eager. This is aligned with my favorite quality about ECA: differentiated learning." Click on the buttons to read more parent testimonials. Eagle Creek's parents like to help with tech & science. 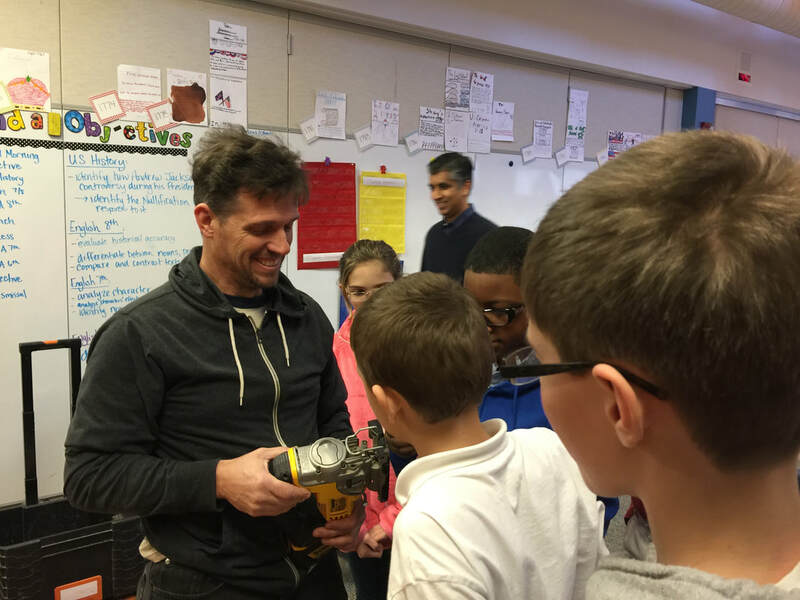 Mr. Gamache, a master carpenter, stopped by to demonstrate safe use of power drills and saber saws, so the Destination Imagination team could build its next project. Keegen's grandma (Obia-chan) and Mrs. Suzuki visited the kindergarten class to share their culture and show some of Japan's customs. Keegen's mom wasdressed up in a traditional Kimono, they learned how to play the harmonica, and saw how their names would look if they lived in Japan. Dr. Nowinski taught our middle school students about the structure of the eye, how vision works, and the modern techniques she uses to treat eye diseases. 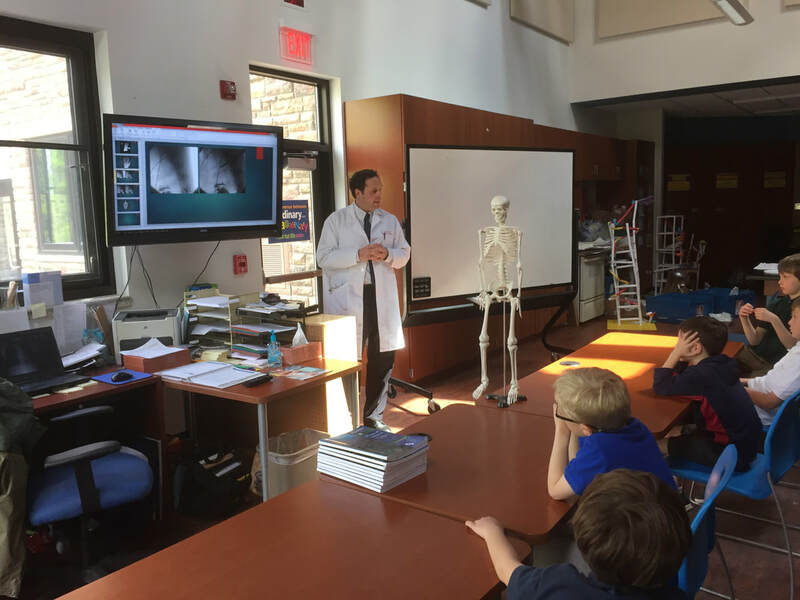 Dr. Carter showed the 2nd grade x-rays and talked about how to take care of your bones. Nora's mom helped the preschoolers mix some ingredients, and they all watched as the ingredients turned into cake pops! ​for lunch in the cafeteria. ​The children and parents look forward to this special time. Eagle Creek's parents love to share their heritage. On International Day, families prepare presentations, make food, and wear clothes that represent their culture. Watch the video to see how much effort everyone puts in! Mrs. Haddad surprised the Kindergarten children with one of her family's favorite stories. Mrs. Vyas helped us celebrate Diwali, the Hindu festival of lights.